After a few weekends filled with theatre we needed a little family outdoor time to bring back some balance. We have never entered the William C. Whitney Wilderness area. We have driven past with a longing look wondering what lies beyond that road. As we drive down the winding road private posted signs flank the road. At first we are unsure if we are going the right way. Finally those familiar DEC signs start appearing. The William C. Whitney area is surrounded by private land in and around the Wilderness area. We cross the bridge over Little Tupper Lake when someone spots a pair of mallards paddling on the marsh. It is one of our first signs of spring. The horse trail is just beyond so we eagerly question what other spring gifts may be on the trail. We have no plans to walk the complete four miles to the shore of Little Tupper Lake. Stony Pond is a little closer at 2.75-miles. The snow is granular and the ground is bare in most places. The snowshoes are obsolete here. We kick them off and leave them at the side of the trail and continue on foot. About a mile later the trail opens up to a wide field with a brook and remnants of a beaver dam. We decide not to press on. We hear birds in the distance and search the surrounding trees for signs of growth. It is still a bit early. The weatherman is predicting snow. That is fine as well. A few well-directed snowballs and we also find all the good things to do with spring snow. From Tupper Lake drive about 12 miles on Route 30S toward Long Lake. Turn west onto Route 10A (Sabattis Circle Road) for 2.9-miles. At the fork in the road proceed on Route 10A, crossing the bridge overlooking Little Tupper and the parking area to Stony Pond Trailhead is the next right. (Westport) The Depot Theatre is making sure its 40th year celebration reaches new heights with the opening of the Tony award winning musicaltribute to jazz great Fats Waller. 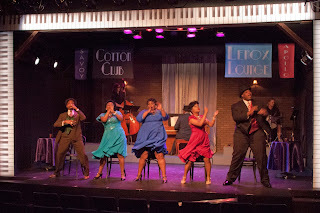 Depot Theatre’s production ofAin’t Misbehavin’ celebrates the Waller songbook with an ensemble cast that has the audience clapping, stomping, and rising out of their seats. Earth Day is Every Day! I hate plastic drinking straws. My children both have been taught to say NO to the straw when we go out to eat. It isn't a perfect scenario. I understand that some people find it easier to drink out of a straw so here are some options to kick the plastic straw habit. 1) Get in the habit of saying No to the Straw. I have to remind myself to ask for "no straws" at a restaurants. It's a work in progress. 2) Purchase reusable stainless steel straws. I keep a container near the fridge where my children and their friends can grab a straw to use around the house. I also have one in my bag and a few in each car's glovebox. To solve the issue of plastic outside the house, I looked into purchasing paper straws. Though inexpensive, the packaging and shipping can be an issue. 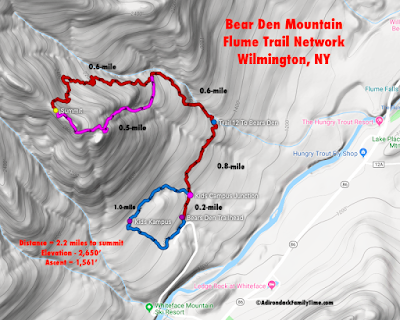 Our recent hike up Bear Den Mountain in Wilmington, NY (Whiteface Region) shouldn’t be confused with the similarly named “Bear Den,” which is the approach up Dial Mountain (High Peak #41) near the AuSable Club. Our fast, steady 2.2-mile hike starts near the Whiteface Mountain Ski Kids Kampus in Wilmington. Since Whiteface is a busy resort, the lots are sometimes filled up at Whiteface, so we let the parking attendant know our destination is the Kids Kampus. This time the parking area has plenty of room for us to park. Depending on the season, micro-spikes or snowshoes are recommended.